The navigation bar might very well be the most important part of your website design. Calgary businesses get more response from their site if visitors find what they’re looking for quickly and easily. Your site’s navigation is a kind of reference point on every page. It’s the primary tool for orientating your users. 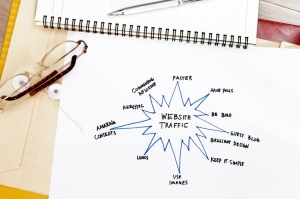 It directs them deeper into your website, and when done well, will seem almost invisible. Navigation needs to be unique to your site, but it must also follow established usability and design conventions. The most effective way to approach website design in Calgary is with a “content first” methodology that focuses on providing your users with the information they are looking for speedily and clearly. With this in mind, you can begin to develop the information structure or architecture of your site, and tailor it to your type of company. For retail businesses, for examples, site architecture usually includes elements like products and services, information about your company and an online store. When you have settled on the elements that will be a part of your site’s architecture, the next step is to decide on the best way to organize them. Think about how your visitors will come to your site and how you want them to use it. Storyboards and flowcharts can make it easier to map out several different ways to get through your content effectively and in a way that makes sense. With an architecture and organization in place, you can begin the task of deciding on the best navigation for your website. Your navigation should be on every page with the same basic structure throughout your site. Changes to navigation should show locations within your site’s hierarchy. Most importantly, your navigation should be meaningful, easily understood and accessible. The main role of navigation is to give people a meaningful choice. Too many options will slow your site’s visitors down. Most designers recommend five to seven “channels” on the navigation bar. Studies have shown that people pay the most attention to items at the beginning and end of lists, so build on people’s expectations and position your most important items accordingly. The home link should be farthest left and action links should be on the right with a contact link at the end. Make your links descriptive and easily understood, so someone who has never been to your site will have a good idea of where a link will take them. Avoid “cute” language in favour of familiarity, but keep your links descriptive without being too generic. We’ve come a long way from the days when cool website design in Calgary was all about animated graphics and slow-to-load images. When you’re considering a design for your business’s site, you can’t afford to make any mistakes. Our free ebook can help you make your website more effective. Deciding on the right navigation for your Calgary business’s website design could mean the difference between satisfied customers and poor user-friendliness. Planning and organization are essential. We recommend you start simple and determine what content your users will want to get to most quickly. A simple mistake could lower your search rankings so many potential visitors might never even make it to your site in the first place. It takes a number of elements to bring out your website’s full potential to generate leads and sales. At Emphasize Design, we specialize in bringing together all the pieces, so they work for you. Visit our featured clients’ sites to see examples of our work and let us create a complete online marketing package for you. We’ll even design your site for free! Our creative lead and head designer, Mike conceptualizes your ideas and inspiration into beautiful, streamlined, functional websites. The artist of the group and authority on all things visual, Mike makes your graphics, logos and designs come alive on your site’s pages to infuse additional value into your products and business. What are the Different Types of Ecommerce Shoppers? Interested in any of our services? All Rights Reserved. Copyright © 2018. Emphasize Design Inc.